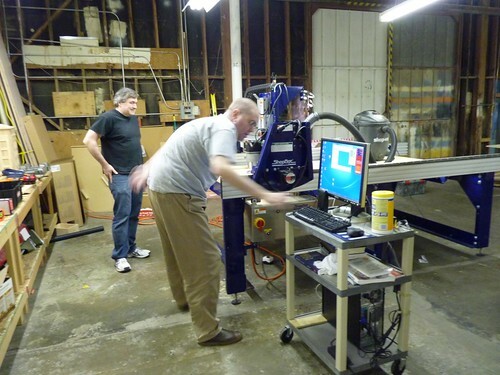 We’re loving our new ShopBot, a robotic wood cutting/carving machine. I’ve been looking for projects that highlight the machine’s capabilities. This Wooden counter was designed and made by Matthias Wandel. Fascinating and exactly what I was looking for. 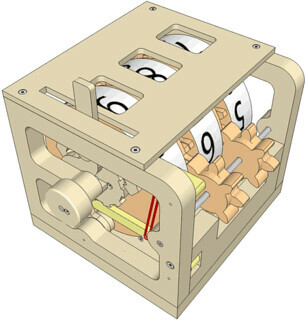 Matthias has examined traditional mechanical counters and explains their workings while designing one in wood. His full write-up shows examples of each aspect of the mechanism. 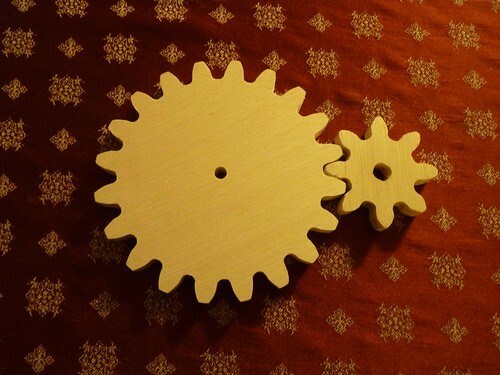 Matthias makes all his wood gears using a bandsaw. 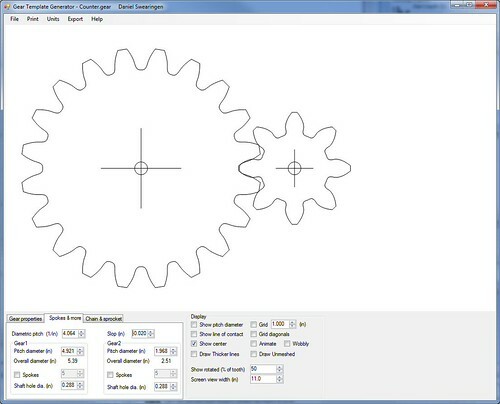 However, he designs his gears using a program he wrote and comments on the ShopBot forums confirmed that the output of this software works in the PartWorks program. Confused yet? So was I. It was time to start working this process methodically. First I bought Matthias’s plans. At $12 I feel these are an excellent value and I strongly recommend that others purchase these plans if you are interested in this project. I found one page that had two gears I thought would make a good start on the learning curve. 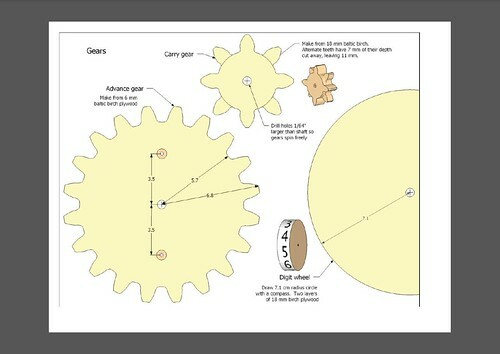 First I wanted to make the 20-tooth large gear and the 8-tooth smaller gear. I bought Matthias’s Gear Template Generator program for $26. 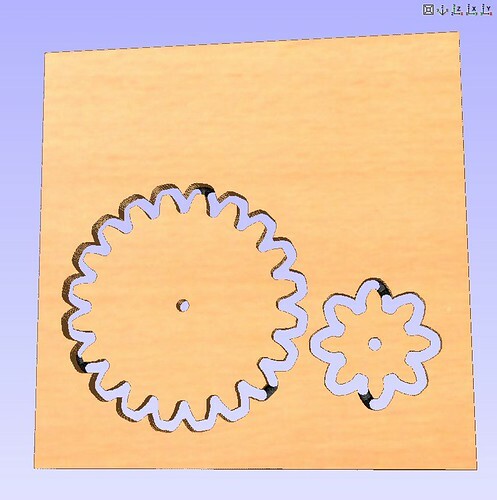 After a bit of experimenting with the various parameters I had a set of gears that were the same size and shape as the those in the counter plans. 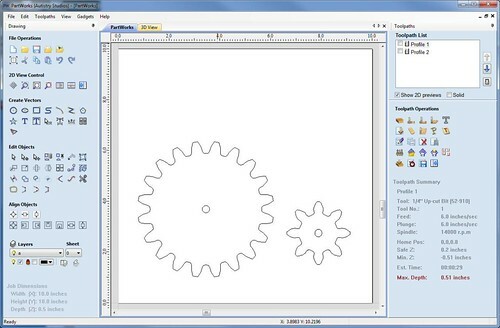 Next I exported these gears in DXF format which can be imported into PartWorks. 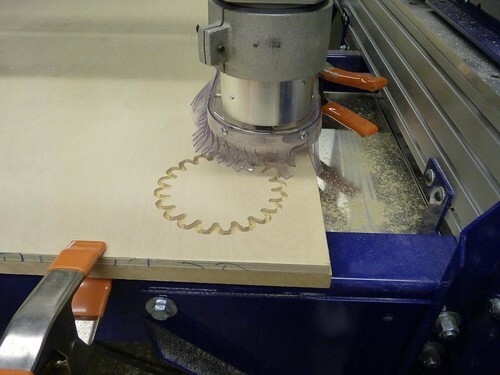 PartWorks is a program supplied with the ShopBot and it has two functions: manipulation of drawings, and conversion of drawings into cutting instructions that can be read and executed by the ShopBot. Importing the gear drawings was seamless and some checking confirmed that a standard 1/4-inch cutting bit would be able to cut the gears with almost no loss in curve detail. Next I generated a cutting path and used PartWorks preview cutting feature to confirm it was doing what I intended. I did one “air cut” where you have the machine move through the cut but in the air above the wood. This allows you to confirm that the movements look as you expect and stay within the range you expect. I set up some 1/2-inch birch plywood (note that I used four spring clamps, you can only see two in the pictures), calibrated the ShopBot and started the cut. One mistake was that I only used two small remainder-tabs on the smaller gear. it needed more so when the ShopBot moved to cut the center hole the small gear broke loose and rattled on the bit making a large rough center hole. 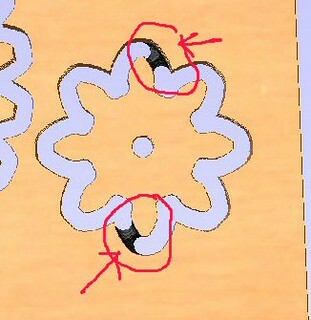 Little errors like this are why you test! Other than the enlarged center hole, the gears look and work great. 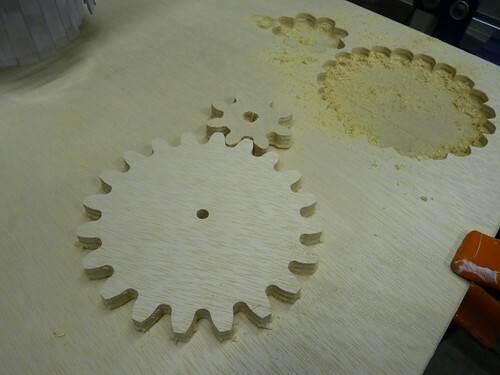 After a little sanding, I have my first two gears. Over the next few weeks I’ll convert Matthias’s counter plans into a format usable by the ShopBot and proceed to make the parts. This entry was posted by Dan Swearingen on Sunday, December 23rd, 2012 at 10:51 pm	and is filed under Project Ideas, Team Blogs. You can follow any responses to this entry through the RSS 2.0 feed. Both comments and pings are currently closed.